America needs to back up its allies (Israel, Saudi Arabia, and potentially Turkey), and isolate its adversaries (Iran, Russia, China, Islamic State). Everything else is secondary. 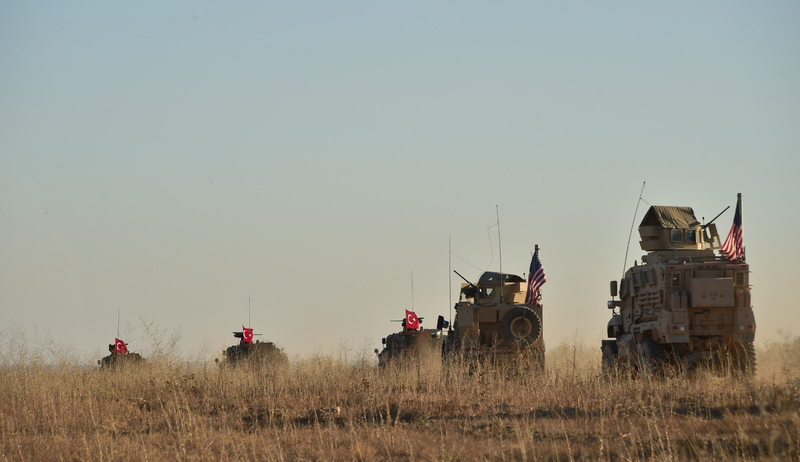 Turkish and American armored vehicles troops on joint patrol in the northern Syrian city of Manbij on November 1, 2018. Anadolu Agency/Getty Images. Michael Doran, a senior fellow at the Hudson Institute and the author of Ike’s Gamble: America’s Rise to Dominance in the Middle East(2016), is a former deputy assistant secretary of defense and a former senior director of the National Security Council. He tweets @doranimated. President Trump’s surprise December 19 announcement of an immediate withdrawal of American forces from Syria hit some Israelis like a sucker punch. “With this withdrawal, the United States abandons Syria and leaves Israel alone,” said Yaakov Amidror, a former national-security adviser to Prime Minister Benjamin Netanyahu. While conceding that “the effect of the U.S. decision is primarily psychological and diplomatic,” Amidror continued: “In those arenas, this is a very significant decision.” Subsequent reports to the effect that the drawdown of forces will be slower than originally announced and coordinated with America’s allies have softened the blow, but the shock still remains. In the intervening months, however, the president’s top advisers seemed to suggest that the withdrawal would never happen. “We’re not going to leave as long as Iranian troops are outside Iranian borders, and that includes Iranian proxies and militias,” said National Security Adviser John Bolton last September. Given Bolton’s proximity to the president, the promise sounded authoritative. The shock in Israel, then, was understandable, and it quickly gave way to related fears. Trump’s Syria decision is clearly part of a larger effort that includes patching up American relations with Turkey, a goal that leaves Israelis decidedly cold. For over a decade, Jerusalem’s relations with Turkey have been abysmal, with no prospect of improvement on the horizon. Recep Tayyip Erdogan, the Turkish president, who aligns with the Muslim Brotherhood in the Arab world, would appear to have made hostility to Israel an enduring part of his political persona. To make matters worse, the American withdrawal will likely entail a downgrading of U.S. relations with the Syrian Kurdish forces that have aided the United States in the fight against Islamic State. But the greatest source of Israel’s fears is not Turkey; that distinction is held by Iran. The American presence in Syria had formed the primary obstacle in the way of Iran’s completing a land bridge and an unbroken corridor of political influence from landlocked Tehran to Beirut on the Mediterranean shore. With only 2,000 soldiers, the United States was controlling, indirectly, about a third of the entire country, yet this small force was still large enough to overwhelm any potential combination of adversaries, as it proved last February when it annihilated some 200 Russian mercenaries in a matter of hours, with no losses on the American side. No question, the American withdrawal will indeed create a vacuum in the region that Iran—and behind Iran, Russia—will inevitably seek to fill, thereby escalating clashes on the ground with Israel. Indeed, within days of Trump’s decision, Israel launched a premonitory airstrike deep into Syrian territory on Iranian targets, causing serious ripple effects in relations between Jerusalem and Moscow. As Israel squares off against this Russian–Iranian axis, what kind of support will it receive from the White House? Not much, if American congressmen and senators, and major pundits in the media, know what they’re talking about. The prevailing view among them is not just that Israel feels sucker-punched; it is that Israel has indeed been sucker-punched. The truth is less alarming, however. The second theme focused on the difficulties the decision will impose on allies like Israel—difficulties said to be almost entirely of Trump’s making but to which he seems completely indifferent. Mattis’s letter of resignation helped feed this motif in pointing out that the defense secretary’s own “views on treating allies with respect” were at odds with the president’s. In some circles, these motifs led immediately to invidious comparisons between Trump and Barack Obama. Yes, the argument went, Trump moved the embassy to Jerusalem; and yes, Nikki Haley, his first ambassador to the United Nations, was a vast improvement over her predecessor. But such gestures of support to Israel are symbolic only, and symbolism, however welcome, won’t keep the wolf from the door. When it comes to the hard security of Israel, the analysis continued, Trump is unreliable, far more so than his predecessor, who may have reached out in friendship to Iran, but did so in a systematic and fully thought-out fashion. This leads us to an important substantive point that has been largely overlooked in the high dudgeon directed at the president’s modus operandi. The essential choice, the Economist would have us believe, is between the orderly, reasonable withdrawal from the Middle East offered by Barack Obama and the chaotic, blustery one currently being orchestrated by Trump. The end result, however, is the same: withdrawal from the Middle East and the end of American “hegemony” there. Give the Economist its due. Trump’s Syria decision does place significant risks before America’s allies. The decision, furthermore, forces us to contemplate competing approaches to withdrawing the United States from the Middle East. To this we might add that choosing between them would be the most consequential decision that Americans would make regarding the Middle East in the coming decade. So the stakes could not be higher. The Economist gets the big story about Syria completely wrong—as do most of the prestige media. But the Economist also gets the big story completely wrong—as do most of the prestige media. The choice that actually faces us, the one muddled by all the handwringing over the president’s personal character and by the crocodile tears being shed, momentarily, for Israel, is of a different order entirely. It is a choice between, on the one hand, a withdrawal of American power based on the conviction not just that the situation has become hopeless but that over the decades the U.S. choice of allies, including Israel, has made it worse—the Obama position—and, on the other hand, a withdrawal of direct American military engagement while ensuring that the United States will continue reliably to support those same historic allies and others drawn to its and their side, thereby enhancing the possibility of a stabilized Middle East in the next decade. To dig out the truth about Trump’s Syria decision requires us to spool back five years and refresh our memories of what might be called “the Palin doctrine.” In a political speech in 2013, Sarah Palin, the former governor of Alaska and former Republican vice-presidential candidate, offered her own preferred solution to problems like the then-raging Syrian civil war: “let Allah sort it out.” This idea has exercised far greater influence on American policy than most observers have realized. In 2013, Sarah Palin offered her own solution to problems like the then-raging Syrian civil war: “let Allah sort it out.” This idea has exercised far greater influence on American policy than most observers have realized. Around the time that Palin announced her solution, Barack Obama began making his own case for non-intervention in the Syrian civil war. If Palin’s justification carried about it more than a whiff of anti-Muslim sentiment, Obama exuded empathy for the dying Syrians and agonized elaborately over the trade-offs he was nevertheless compelled to make between the need to honor our “highest ideals and sense of common humanity” and the need to “advance our security.” As president, Obama reminded us, he was “more mindful” than most people of “our limitations.” And so, though it pained him greatly, he, too, would favor leaving Syria’s fate to Providence. Indeed, he’d already done so. Recall that in August 2012, Obama had drawn his famous “red line,” threatening severe retaliation if the Syrian dictator Bashar al-Assad were to use chemical weapons. A year later, following a particularly heinous chemical attack, the president came under political pressure to make good on his threat. But even as he readied a military response, he was working in secret to erase his red line. In this he was helped by, in effect, the Palin doctrine, now embodied in the persons of the Tea Party Republicans on Capitol Hill. Obama knew that, if these isolationist types were asked to authorize an attack on Syria, they would refuse. And so, making as if the Constitution gave him no choice but to seek congressional approval for a strike, and fully expecting to be turned down, he did ask them. Ben Rhodes, Obama’s national security adviser for strategic communications, later revealed how Obama explained this move to his aides. “The thing is,” Rhodes quotes the president as saying, “if we lose this vote [in Congress], it will drive a stake through the heart of [interventionist] neoconservatism—everyone will see they have no votes.” Thus did Obama shrewdly turn Palin’s doctrine into something close to a bipartisan consensus. Sure enough, in the 2016 elections, the two candidates on the left and the right who whipped up the most enthusiastic support were Donald Trump and Bernie Sanders. Both campaigned on a non-interventionist platform. Like Obama before him, Trump had concluded that his personal certainty about the futility of military deployments in the Middle East was backed by a powerful electoral imperative. Today, there is no reason to imagine that other major presidential candidates in 2020 will arrive at a different conclusion. Whether delivered in the abrasive style of Sarah Palin or the silky tones of Barack Obama, the Palin doctrine is now the baseline American position. It is not, however, the baseline position of the pundit class. Two groups produce much of the most significant analysis about the Middle East in the American media: neoconservatives on the right, former Obama officials on the left. Both groups are hostile to Trump, convinced that he is a danger to the country and that his policies are woefully misguided. The second group is politically more influential than the first. The neoconservatives, rejecting the notion that non-interventionism is now inescapable, continue to push muscular answers as if they enjoyed mainstream support. Unfortunately, these three short sentences, if translated into policy, would simultaneously put Turkey, Saudi Arabia, and Iran into a straitjacket, nullifying the strategic fact that they are not at all the same—the first being a once and possibly future ally, the second a longstanding and current ally, and only the third an enemy. Whatever this amounts to, it is not foreign policy. As for the second foreign-policy group, it functions both as a brain trust of the moderately progressive wing of the Democratic party and as a whisperer for the prestige liberal media. Its members, too, seek to tarnish Trump personally, but the alternative they favor for the Middle East is Obama’s policy of engaging America’s enemies, especially Iran. Thus, last spring, as Trump moved to withdraw from Obama’s nuclear deal, former Secretary of State John Kerry engaged in a flurry of diplomatic activity designed to thwart the president’s initiative—activity that, the Boston Globe stipulated in its report, was, to say the least, highly “unusual” for a private citizen. In two years’ time, Diplomacy Works and related groups hope, Trump will be voted out of office and a new president can return American foreign policy to the grooves that Obama defined. And so, when the Economist both likens and contrasts Trump’s approach to Obama’s, it is not simply making an academic comparison. To the degree that Obama-style courting of America’s enemies is the shadow foreign policy of “centrist” Democrats, the magazine is describing today’s electoral options—sophisticated and deeply considered versus frivolously whimsical and frighteningly dangerous—as it sees them. It would no doubt be too much to expect a news outlet to undertake a study of the actual (as opposed to the alleged) logic of the current administration’s position and its goals, and how the Syria withdrawal serves them. And yet that decision is in fact part of a coherent vision, neither interventionist in the neoconservative sense nor isolationist in the Palin/Obama sense, of a new American order in the Middle East. The United States may lately have grown deeply skeptical of military action, but it retains a vital interest in building a stable order in the Middle East, if for no other reason than to keep the region’s worst pathologies at bay. In the Trump administration’s conception, three key obstacles stand in the way of an order amenable to American interests and to the interests of peace. The first is what might be called jihadistans, zones of chaos defined by failed states like Syria and Yemen. Offering no easy or immediate path to a better future, the jihadistans are problems that must nevertheless be somehow managed. The second is the problem posed by Sunni terror groups like al-Qaeda and Islamic State, which take root and prosper in the jihadistans. The third is the rise of Iran, which, abetted by Russia, is training and equipping Shiite militias based on the Hizballah model; these it deploys to project its power into at least four different Arab countries: Iraq, Syria, Lebanon, and Yemen. The administration seeks to contain both the Sunni terror groups and Iran simultaneously. If the deployment of American forces on the ground is the tool of last resort, and therefore to be avoided if at all possible, then the next best option—indeed, the only sensible option—is to work through allies. When, however, one surveys America’s traditional friends in the Middle East, very few have the ability to project power beyond their borders. Only three truly stand out in that regard: Israel, Saudi Arabia, and Turkey. Notably, the Obama administration, in pursuing its Iran policy, fell out with all three. Only three of America’s friends in the Middle East can project power. The Obama administration, in pursuing its Iran policy, fell out with all three. In each case, Obama was careful to present the tensions with those allies that his policy had itself created as the result of conflicts over values—a construal that implicitly put his administration on the side of the angels. Saudi Arabia was a Wahhabi state with a democracy deficit. Turkey was led by Erdogan, an authoritarian who was turning a blind eye to al-Qaeda and Islamic State in Syria. Both countries were trying to drag the United States into a destructive Sunni-Shiite conflict—as if their policies derived from base sectarian motives rather than (as was the case) a shared fear of the Iranian–Russian alliance. Somehow, the White Houses’s vaunted commitment to humanitarian values never induced it to rethink its own shameless outreach to the regime in Tehran, more brutal and more sectarian than its Sunni rivals. By contrast, from the moment Trump took office it was obvious that he planned to work with, and through, Israel and Saudi Arabia. His plans for Turkey have been less apparent, so let’s start there. Rebuilding the American alliance with Ankara is a formidable task. The source of the difficulty resides primarily in the deal brokered by the Obama administration with the YPG, the Syrian Kurdish Forces that the United States turned into its primary partner in defeating IS. Critics of Trump’s Syria withdrawal routinely make two points. First, the actual cost of maintaining the 2,000 Americans in Syria was negligible, Second, that being the case, the abandonment of the Kurds this is entailed in the withdrawal reveals the administration to be just another in the long line of American governments that could never be trusted to keep their word. Both points ignore the simple fact that, by developing the relationship with the YPG in the first place, Obama had himself betrayed a treaty ally. And it was a costly betrayal. The YPG is the Syrian wing of the PKK, the Kurdish separatist organization in Turkey that any Turkish president, not just Erdogan, would regard as a mortal enemy. By mid-century, Kurds are estimated to make up over one-third of Turkey’s population. The Kurdish question therefore is the most significant in the country’s domestic politics and in its foreign policy. The issue is, in a word, existential for the Turkish Republic. By aligning with the YPG, the United States drove Turkey into the arms of Russia, and sowed the seeds of a multiyear Kurdish–Turkish war. Out of a misguided commitment to these Kurdish “allies,” any American forces still in Syria would therefore be obligated to remain ensconced there for many years to come. Trump’s Syria withdrawal cut the Gordian knot that Obama’s ill-considered policy had created. Whether it can help lead to more positive outcomes between Washington and Ankara remains to be seen. Next, Israel. Trump’s conception of the Middle East is hardly a dream world. To an ally like Israel, it presents, to put it mildly, very serious challenges—one of which stands out: if the Israelis have any hope of preventing Syria from becoming a permanent Iranian military base, they must act alone. Only independent military action can solve their problem. This is indeed a daunting prospect, especially when one considers that behind Iran stands Russia, making the risk of an Israeli–Russian war a very real possibility. But it is a mistake to interpret Israel’s loneliness as a direct result of Trump’s withdrawal from Syria. The withdrawal focuses the mind on an unpleasant reality, one that the withdrawal did not create. After all, the 2,000 American troops had no legal mandate to engage Iranian troops unless directly threatened by them (as they were last February). Significant Democratic voices in Congress, joined by a few Republicans, were already loudly underscoring this point and demanding a timely withdrawal, a demand that grew even sharper teeth after November’s mid-term elections. Even if Trump had been personally more inclined to keep the troops in place, he likely would have come under pressure to pull them out, especially if Turkish operations against the Syrian Kurds put the Americans in harm’s way. Israel’s fate is a lonely one, but Israel is very powerful militarily, possibly more powerful than at any time in its history, and it is not at all isolated. In the administration’s conception, the United States fervently desires to see Israel succeed in curtailing Iranian power. Trump and his foreign-policy advisers, led by Bolton and Secretary of State Mike Pompeo, will likely be eager to provide Israel with any weapons and intelligence it may lack to do the job. They will also continue to coordinate closely with it politically, and ensure that the United States serves as a deterrent to Russian military action. In their sudden solicitude for Israel, the administration’s critics, for their part, have drawn a false distinction between the “symbolic” steps that Trump has taken in favor of the Jewish state, like moving the embassy to Jerusalem, and the supposedly “real” support that the 2,000 troops were providing and that would now be lost. In international affairs, however, “symbolic” support with tangible diplomatic, political, and historical consequences, like moving the embassy, is real support—as few know better than Israel’s leaders. Obama and the former officials in his “echo chamber” (to use Ben Rhodes’s impudent term for the network of politicians, pundits, reporters, and broadcasters who faithfully parroted his White House narrative of Obama’s Iran policy) have insinuated that their adversarial attitude toward Israel arose out of one of those tragic clashes of values so dear to the former president’s mentality. In this rendition, Obama cared deeply about democracy and human rights—meaning Palestinian rights—whereas the chauvinistic government of Benjamin Netanyahu did not. Granting that Obama did sincerely disagree with Netanyahu on the Palestinian issue, this claim was nevertheless a dodge. In plain fact, the attitude toward Israel was itself part and parcel of the Obama administration’s approach to regional order: the outreach to Iran required a downgrading of America’s traditional allies, among whom democratic Israel was clearly the most irksome. Joseph Biden, the former vice-president, recently expressed the matter with admirable clarity. “Our biggest problem is our allies,” he said in an interview. While in office, Biden had made the same statement, but in the belief that he was speaking off-the-record. When the statement became public, the ensuing controversy forced him to retract and apologize. As we now see, it was no mere slip of the tongue but in fact his considered judgment. Finally, Saudi Arabia. Nowhere has the Biden mindset been more pervasive, or more pernicious, than in the prevailing attitude among liberals and Democrats (and some Republicans) toward Saudi Arabia, which, under Crown Prince Mohammad bin Salman, has committed the unpardonable sin of working closely with the Trump administration to dismantle the Iran deal and to reconstitute a coalition dedicated to containing Iran. The crown prince has been depicted as spoiled and reckless, and his erratic behavior, so the story goes, is a major threat to stability in the Middle East and a danger to the United States. Before swallowing this tale whole, one would do well to ask a few pointed questions. In the Middle East, which state of consequence shares Israel’s interest in preventing Iran from developing a nuclear-weapons capability? Which state is similarly dedicated to curtailing Iranian power on the ground in Syria and Yemen? Which will help promote a strategic view of the Middle East that correctly sees the rise of Iran, and not the Palestinian question, as the key problem to be solved? Finally, which Arab leader has done the most to advance a general warming of relations with Israel and, incidentally, shares with Israel a deep distrust of the growing influence of Recep Tayyip Erdogan in the Arab world? In brief, the convergence of interests between Israel and Mohammad bin Salman’s Saudi Arabia is both startling in its breadth and historically significant. It also comes at a fortuitous moment, when other regional allies of the United States can no longer take Washington’s support for granted. Indeed, the Saudi–Israeli convergence is, in part, a response to the fact that, on the international scene, America has gone wobbly. The convergence of interests between Israel and Mohammad bin Salman’s Saudi Arabia is both startling in its breadth and historically significant. Trump’s conception of regional order quite openly seeks to further the Saudi–Israeli convergence and to build upon it, in hopes of constructing an effective policy of containment even in an era of domestic wariness regarding military commitments abroad. Of course, it is no secret that this initiative has been met recently by a ferocious countereffort to anathematize Mohammad bin Salman and throw ice water on any idea of America’s engaging Saudi Arabia altogether. The weapon was handed to the administration’s critics when Saudi assassins murdered the journalist Jamal Khashoggi in the Saudi consulate in Istanbul on October 2. Now the very same critics who claim vociferously that Trump’s Syria withdrawal has betrayed America’s allies, including Israel, are mounting a no-holds-barred attack on Israel’s tacit partner in confronting the Iranian threat and America’s own longest-term ally in the Arab world. Indeed, one of the greatest achievements of this campaign has been to convince people, even people with foreign-policy experience, that Khashoggi’s murder is more than just a point of bitter contention between Riyadh and Washington; it is a matter of the utmost strategic significance for America. Nor have Republicans been paragons of strategic clarity. To take a single instance: instead of directing the resources of his office to the machinations of the primary enemies of the United States, the Tennessee senator Bob Corker, outgoing chairman of the Senate Foreign Relations Committee, busied himself with the weighty task of thwarting Trump over the Khashoggi murder. He hauled Gina Haspel, director of the CIA, to Capitol Hill to give a bipartisan group of like-minded senators a detailed intelligence briefing on the crown prince’s involvement in the affair. Corker, together with Senator Bob Menendez, also sent a letter to Trump demanding a formal determination as to whether bin Salman was personally responsible for the killing of Khashoggi. Under the terms of the Global Magnitsky Act, such a determination would automatically trigger sanctions against the de-facto ruler of Saudi Arabia. But what makes Khashoggi a test in the competition with authoritarian powers? Over the last three months, as the American media have been obsessed by the Khashoggi affair, stories have broken regarding, among other things, the forcible detention by China of one-million Uighurs and the kidnapping and forcible return to China of Meng Hongwei, the former president of Interpol. Both are far more consequential for American foreign policy than the Khashoggi affair, yet they have received a fraction of the attention. The case of Meng is particularly noteworthy. In recent years, Beijing has kidnapped, forcibly repatriated, incarcerated, and tortured numerous Chinese nationals. Among the hundreds captured in this brazen worldwide operation, code-named Fox Hunt, are dozens of individuals from Canada and Australia; others have even been snatched from American soil. How many well-informed Americans can identify by name a single one of them, or even identify the American cities where they were taken? How many American pundits and politicians screaming to punish Mohammad bin Salman have made similarly urgent arguments about the need to punish Chinese leader Xi Jinping for his multiple affronts to American sovereignty? Exaggerating the significance of Khashoggi’s murder sends a signal of American confusion to the world. Exaggerating the significance of Khashoggi’s murder sends a signal of American confusion to the world. It suggests that the world’s only superpower has lost the meaningful capacity to differentiate one heinous misdeed by a close ally from continuous threats posed by its true enemies, not least in the Middle East itself. Every word expended on the Khashoggi affair has been a lost opportunity to discuss, for example, such simultaneous machinations as the plot by Iran to carry out an assassination in Denmark, the second such plot in Europe this year, or the discovery of tunnels being dug by Hizballah from Lebanon into Israel. A resolution expressing the sense of the Senate that Crown Prince Mohammad bin Salman bin Abd al-Aziz al-Saud of Saudi Arabia be held accountable for contributing to the humanitarian crisis in Yemen, preventing a resolution to the blockade of Qatar, the jailing and torture of dissidents and activists inside the Kingdom of Saudi Arabia, the use of force to intimidate rivals, and the abhorrent and unjustified murder of journalist Jamal Khashoggi. Although Graham’s resolution covered all the bases, it has yet to go to a vote. But two similar resolutions did pass, both of them bipartisan and one of them, co-sponsored by Bernie Sanders and Senator Mike Lee, a Republican from Utah, invoking the War Powers Act. If the paltry, non-lethal support the U.S. is offering to the Saudi-led coalition actually constitutes war-fighting, then virtually every act of U.S. foreign policy would similarly fall under the purview of that act. In Yemen, however, what will determine the course of events is indeed the iron logic of war. The Houthis are an Iranian proxy force. If they win, Iran will win. If they merely force a stalemate, Iran will retain a base on Saudi Arabia’s southern border from which rockets and missiles provided by Iran can target Riyadh. Precisely as it has done in Lebanon for Hizballah, and against Israel, Iran will have every incentive to increase the size and power of that arsenal. No senatorial display of outrage can refute this logic. A policy of punishing Saudi Arabia will not improve “the humanitarian crisis in Yemen,” and it will not stop the fighting there. It will succeed only in handing Iran a victory and the U.S. a strategic defeat. By contrast, the only way to insure that we do end the killing, end the humanitarian crisis, and achieve our strategic goal of containing Iran is to work for a Saudi victory. This is the stark logic of war. If the humanitarian cost of a Saudi victory is too high for our moral sensibilities to bear, then the only answer is for the U.S. to become more engaged, to help the Saudis with their strategy and their tactics, to bring the war to a quicker and more decisive outcome that will destroy the lives of fewer people. Those are the real options—moral and strategic. No one in the Senate is discussing them. Call it the punitive agenda: one that will weaken the American position in the Middle East and expose Israel to further risks, as some Israelis themselves have made abundantly clear. “Don’t throw the prince out with the bathwater,” the Israeli ambassador Ron Dermer urged. It is wise counsel, unfortunately unheeded by American senators who, full of passionate intensity, have lent bipartisan legitimacy to a program designed to destroy any effective containment policy of the kind outlined above. No good can come from this, and it has the potential to do much harm. The challenges of the Middle East are many and complex. Trump’s strategy of refraining from direct military engagement while assuring support to one’s allies, therefore, is by no means guaranteed to succeed. But in an era of deep skepticism about the deployment of American forces in general, it represents the only viable strategy if the twin goals of American policy are to contain the Sunni terror organizations and Iran simultaneously. The successful containment of Iran would, in turn, reduce the power of Russia, whose expanded influence in the region is largely dependent on Iranian-led ground forces. In a January 2014 interview with David Remnick, the editor of the New Yorker, Barack Obama made clear that although the allies of the United States expected him to help them contain Iran militarily, he refused to play that role. Instead, he envisioned “a new geostrategic equilibrium” in which the United States would mediate between its traditional allies and Iran. From 2014 on, Obama sought to implement this conception, which his acolytes continue to tout. Obama saw the Middle East as a roundtable, at which Iran and Russia would be prominently seated. The job of the United States, in this conception, was to advance proposals for stabilizing the region that would be acceptable to all of the “stakeholders” around the table. But this approach suffered from a debilitating fallacy or, rather, delusion: namely, that the true ambitions of Iran (and Russia) were purely defensive and, therefore, limited. Its advocates assumed that Tehran’s public rhetoric calling for the expulsion of American forces from the region and for the ultimate destruction of both Israel and the United States was just that: rhetoric. What Iran truly coveted, they believed, was legitimacy and security. It was looking for a deal. If the United States would only treat Tehran with respect, the Islamic Republic would become a reasonable partner for stabilizing the region. During the Obama presidency, Iran pocketed every tangible concession from the United States while offering largely token concessions in return. During the Obama presidency, Iran pocketed every tangible concession from the United States while offering largely token concessions in return. As Iran’s militias on the ground gobbled up territory, the regime grew more solvent, stronger militarily, and more confident of its ability to threaten American allies with impunity, as evidenced by, among other things, its ever more aggressive support for the Houthi rebellion in Yemen. As a result, the region grew more violent and more unpredictable, and America less reliable. Iran today is more than happy to continue nurturing this delusion through limited diplomatic engagement, provided that America continues to turn a blind eye to its military advances on the ground while offering Tehran a short path, by means of the nuclear deal, to a completely unfettered nuclear program. Thus has Obama’s conception of regional order led not to the “equilibrium” that he imagined but to chaos and the pronounced weakening of the American security system. In the Trump conception, by contrast, the Middle East is not a round table but a rectangular table. On one side are the United States and its traditional allies. On the other side are its adversaries: Russia and Iran, their proxies, and the Sunni terror groups. The job of the United States, in this conception, is to elevate the power of its friends over its adversaries while simultaneously mediating among the allies, who are a fractious bunch. To repeat: the choice faced by Americans and their allies in the Middle East is plain. It is between seeking to co-opt Iran through American concessions and emoluments and, instead, seeking to contain it (and Russia) through American financial pressure and military and diplomatic pressure from allies. And that is really no choice at all, because abject failure is baked into the previous administration’s approach. The current approach is the only viable option that holds out any chance of success. The “big-time” point is this: an ally is a state that supports the American security system. Two questions should thus decide whether America treats a state as a friend or as a foe. Will the state actively help to defend that system against those—Russia, China, and Iran—who seek to weaken or destroy it? If it won’t take action, will it at least deny its territory and resources to America’s enemies? In the Middle East, if not in the world, these questions should take precedence. When an ally stumbles, we should help it to its feet. When our enemy stumbles, we should help keep it down and on the ground. Any consideration that subverts this elementary logic, no matter how “moral” it may appear on the surface, is fundamentally unsound. The choices in the Middle East are stark: either the United States will build a security system with its own military or with its allies’ militaries, or it won’t have one at all. In the absence of a viable security system, its moral influence in the world will decline significantly. “Without bread,” the Jewish sages say, “there is no Torah.” In foreign policy we might similarly say, “Without basic security, there are no American values.” There are lessons in this for American politicians in both parties, for supporters of Israel, and for lovers and promoters of liberty around the world. This entry was posted on January 7, 2019 at 1:52 PM and is filed under Uncategorized. You can subscribe via RSS 2.0 feed to this post's comments. You can skip to the end and leave a response. Pinging is currently not allowed.